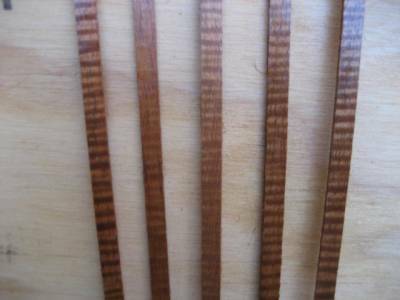 Since I sell curly koa binding, I am often asked questions about bending purfling and binding. 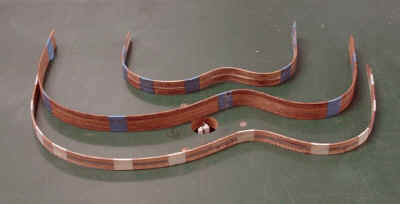 Whenever possible, most luthiers laminate their side purfling strips ( those decorations between the binding and the side of the instrument) to the purfling before bending it. With some of the exotic woods such as koa, that may not always be possible because suitable sized wood is not always available. Most of my curly koa binding comes from scrap pieces and I usually have to bend my side purflings separately. This is a very easy process. To begin with, I always tightly tape together my binding before bending, whether I am including purfling or not. The pieces help to support each other and there is much less breakage. I then wet the entire bundle before bending. If I have thin purfling strips to bend, I include these in the center of the bundle. 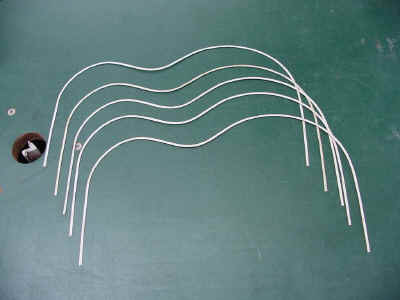 The first photo shows 3 such already bent bundles, 2 with purling strips and 1 without. 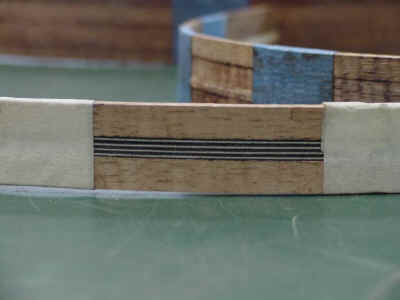 The next 2 photos are closeups of a set of binding including the side purfling. The binding supports the purfling and allows it to be safely bent even though, as in the case of the white strips it is far wider than thick. The white strips are less than .5mm thick and are about 2.1mm wide. The last photos show the thin white purflings bent to shape. I find that you can get a much cleaner look on wood purfing if you do not join the purfling at the same joint as the binding. I run my purflings long, each piece a slightly different length if I have more than one color. I join the purfling ends together with a scarf joint. With a little practice, and a razor sharp chisel, you can make an almost invisible joint and the center joint of the instrument will be much cleaner.